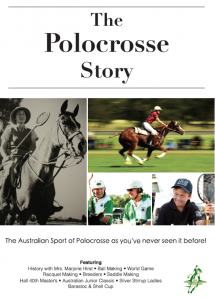 The Polocrosse Story Official Trailer from Palatine Productions on Vimeo. “The Polocrosse Story” is the Documentary you have been waiting for. The real story behind Australia’s very own horse sport of Polocrosse leaves no stone unturned in its’ exploration of a very special game. Crew: Director/Producer/Editor - Ian Withnall. Producer - Sharen Kenny. Narrator - Andrew Lofthouse. Cameras - Ian Withnall and Cole McIntyre. PAA Technical Advisor - Karin Stockman. Cast: Kevin Bradford, “Tiger” Hunter, Will Van Weerdenburg, Greg Davidge, Toni Davidge, Annette O’Donnell, Les & Robyn Fraser, Warwick Fraser, Joy Poole OAM, Neville Gilpin OAM, Dennis Milner, Jess Fletcher, Elissa Koch, Jim Grills, Liam Cardile, Sara & Charlie Grills, David Mortimer, Jane Cooper, Troy Henry, Carolyn Garland, Elizabeth Lyster, Lucy Grills, Mark Wilson, Will Ireland, Prue, Corey & Charlie Ireland, John Rymill, Harry Kirk, Brad Cooper, Graham Bennett, Kent and Libby Wells, Caroline Hope, Tyla Smith, Elle Rands, Colin & Louise Parkinson, Scott Keogh, Craig Pomeroy, Charles Brook, Paige Templeton, Adrian Lester, Shane Trail, Dean Ryan, Kylie Gould, Stuart Shepherd, Mathew Johnson.